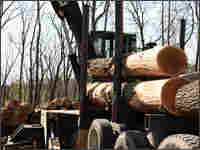 Black Times for W.Va. Red Oak Loggers In the 1980s, oak was in vogue for furniture, flooring and cabinets. But now cherry has become the hot new fashion, and the price of red oak has plummeted 40 percent in the past three years. If you own timberland in West Virginia, you've most likely got an investment in red oak and the value of your tree portfolio is falling fast. There's been a slide in prices, and now, locals say, they're "dropping off a cliff." A red oak tree — the predominant species — is worth 40 percent less than it was three years ago. It's a fashion issue. Oak was popular in the 1980s for cabinets, flooring, furniture. Cat Caperton of Gat Creek Furniture in Berkeley Springs, W.Va., says, "Oak had the connotation of strength, longevity, country values. Nowadays, it doesn't come across as sturdy; it comes across as busy." Cherry has become the new oak, with maple and walnut also in favor. That's why Duane Clemons, who runs a sawmill in the town of Smoot, has enough of the old favorite on hand to sell you 250,000 board feet. He has about 4,000 red oak logs in the mill yard, not to mention the oak he owns that's still standing on various tracts around the state. It's also why Clemons sells oak to China — even though he knows it's used to make inexpensive laminated furniture that's shipped right back to stores in West Virginia. Sawmills in the state have been shutting down, and Clemons says, "If you don't sell to China, you'll be out of business." With red oak prices down and fuel costs to cut timber on the rise, lots of landowners will surely say, "Let's just let those trees keep on growing."